^ Avila, Vernon L. (1995). Biology: Investigating Life on Earth. Jones & Bartlett Learning. pp. 767–. ISBN 978-0-86720-942-6. https://books.google.com/books?id=B_OOazzGefEC&pg=PA767. ^ Mentel, Marek; Martin, William (2010). “Anaerobic animals from an ancient, anoxic ecological niche”. BMC Biology 8: 32. doi:10.1186/1741-7007-8-32. PMC: 2859860. PMID 20370917. https://www.ncbi.nlm.nih.gov/pmc/articles/PMC2859860/. ^ Alberts, Bruce; Johnson, Alexander; Lewis, Julian; Raff, Martin; Roberts, Keith; Walter, Peter (2002). Molecular Biology of the Cell (4th ed.). Garland Science. ISBN 0-8153-3218-1. https://www.ncbi.nlm.nih.gov/books/NBK26810/. ^ Starr, Cecie (2007-09-25). Biology: Concepts and Applications without Physiology. Cengage Learning. pp. 362, 365. ISBN 0495381500. https://books.google.com/?id=EXNFwB-O-WUC&pg=PA362. ^ a b c 浅島・駒崎(2011), p.33. ^ a b 浅島・駒崎(2011), p.42. ^ a b 浅島・駒崎(2011), p.108. ^ a b c 浅島・駒崎(2011), p.115. ^ a b 浅島・駒崎(2011), p.110. ^ a b 藤田(2010), pp.99-101. ^ Maloof, Adam C.; Rose, Catherine V.; Beach, Robert; Samuels, Bradley M.; Calmet, Claire C.; Erwin, Douglas H.; Poirier, Gerald R.; Yao, Nan et al. (17 August 2010). “Possible animal-body fossils in pre-Marinoan limestones from South Australia”. Nature Geoscience 3 (9): 653–659. Bibcode: 2010NatGe...3..653M. doi:10.1038/ngeo934. http://www.nature.com/ngeo/journal/v3/n9/full/ngeo934.html. ^ a b 藤田(2010), p.92. ^ Shen, Bing; Dong, Lin; Xiao, Shuhai; Kowalewski, Michał (2008). “The Avalon Explosion: Evolution of Ediacara Morphospace”. Science 319 (5859): 81–84. Bibcode: 2008Sci...319...81S. doi:10.1126/science.1150279. PMID 18174439. http://www.sciencemag.org/content/319/5859/81.short. ^ a b c d e f g h i j k l m n o 藤田(2010), pp.92-98. ^ Maloof, A. C.; Porter, S. M.; Moore, J. L.; Dudas, F. O.; Bowring, S. A.; Higgins, J. A.; Fike, D. A.; Eddy, M. P. (2010). “The earliest Cambrian record of animals and ocean geochemical change”. Geological Society of America Bulletin 122 (11–12): 1731–1774. Bibcode: 2010GSAB..122.1731M. doi:10.1130/B30346.1. http://gsabulletin.gsapubs.org/content/122/11-12/1731. ^ Conway-Morris, S. (2003). 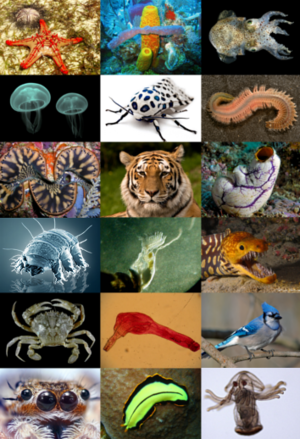 “The Cambrian "explosion" of metazoans and molecular biology: would Darwin be satisfied?”. The International journal of developmental biology 47 (7–8): 505–15. PMID 14756326. http://www.ijdb.ehu.es/web/paper.php?doi=14756326. ^ Valentine, JW; Jablonski, D; Erwin, DH (1999). “Fossils, molecules and embryos: new perspectives on the Cambrian explosion”. Development 126 (5): 851–9. PMID 9927587. http://dev.biologists.org/content/126/5/851.long. ^ Budd, Graham (2013). “At the origin of animals: the revolutionary cambrian fossil record”. Current Genomics 14 (6): 344–354. doi:10.2174/13892029113149990011. PMC: 3861885. PMID 24396267. https://www.ncbi.nlm.nih.gov/pmc/articles/PMC3861885/. ^ Erwin, D. H.; Laflamme, M.; Tweedt, S. M.; Sperling, E. A.; Pisani, D.; Peterson, K. J. (2011). “The Cambrian conundrum: early divergence and later ecological success in the early history of animals”. Science 334 (6059): 1091–1097. Bibcode: 2011Sci...334.1091E. doi:10.1126/science.1206375. PMID 22116879. ^ Kouchinsky, A.; Bengtson, S.; Runnegar, B. N.; Skovsted, C. B.; Steiner, M.; Vendrasco, M. J. (2012). “Chronology of early Cambrian biomineralization”. Geological Magazine 149 (2): 221–251. Bibcode: 2012GeoM..149..221K. doi:10.1017/s0016756811000720. ^ García-Bellido, Diego C; Paterson, John R (2014). “A new vetulicolian from Australia and its bearing on the chordate affinities of an enigmatic Cambrian group”. BMC Evolutionary Biology 14: 214. doi:10.1186/s12862-014-0214-z. PMC: 4203957. PMID 25273382. http://www.biomedcentral.com/1471-2148/14/214/abstract#. ^ a b Smith, Martin R.; Ortega-Hernández, Javier (2014-08-17). “Hallucigenia’s onychophoran-like claws and the case for Tactopoda” (英語). Nature 514 (7522): 363–366. doi:10.1038/nature13576. ISSN 0028-0836. https://doi.org/10.1038/nature13576. ^ a b c d Hernández, Javier Ortega (英語). Lobopodians. http://www.academia.edu/16933971/Lobopodians. ^ a b c d e f g h 藤田(2010), p.113. ^ a b 馬渡 (2013), p.2. ^ a b c 藤田(2010), p.124. ^ a b 藤田(2010), p.134. ^ a b Cannon, Johanna Taylor; Vellutini, Bruno Cossermelli; Smith, Julian; Ronquist, Fredrik; Jondelius, Ulf; Hejnol, Andreas (2016-02). “Xenacoelomorpha is the sister group to Nephrozoa” (英語). Nature 530 (7588): 89–93. doi:10.1038/nature16520. ISSN 0028-0836. http://www.nature.com/articles/nature16520. ^ Dunn, Casey W.; Hejnol, Andreas; Matus, David Q.; Pang, Kevin; Browne, William E.; Smith, Stephen A.; Seaver, Elaine; Rouse, Greg W. et al. (2008-03-05). “Broad phylogenomic sampling improves resolution of the animal tree of life” (英語). Nature 452 (7188): 745–749. doi:10.1038/nature06614. ISSN 0028-0836. http://www.nature.com/doifinder/10.1038/nature06614. ^ Egger, Bernhard; Steinke, Dirk; Tarui, Hiroshi; Mulder, Katrien De; Arendt, Detlev; Borgonie, Gaëtan; Funayama, Noriko; Gschwentner, Robert et al. (2009-05-11). “To Be or Not to Be a Flatworm: The Acoel Controversy” (英語). PLOS ONE 4 (5): e5502. doi:10.1371/journal.pone.0005502. ISSN 1932-6203. PMC: PMC2676513. PMID 19430533. http://journals.plos.org/plosone/article?id=10.1371/journal.pone.0005502. ^ a b c d e f 藤田(2010), pp.122-123. ^ Philippe, Hervé; Brinkmann, Henner; Copley, Richard R.; Moroz, Leonid L.; Nakano, Hiroaki; Poustka, Albert J.; Wallberg, Andreas; Peterson, Kevin J. et al. (2011-02). “Acoelomorph flatworms are deuterostomes related to Xenoturbella” (英語). Nature 470 (7333): 255–258. doi:10.1038/nature09676. ISSN 0028-0836. PMC: PMC4025995. PMID 21307940. http://www.nature.com/articles/nature09676. ^ Rouse, Greg W.; Wilson, Nerida G.; Carvajal, Jose I.; Vrijenhoek, Robert C. (2016-02). “New deep-sea species of Xenoturbella and the position of Xenacoelomorpha” (英語). Nature 530 (7588): 94–97. doi:10.1038/nature16545. ISSN 0028-0836. http://www.nature.com/articles/nature16545. ^ a b c 藤田(2010), p.114. ^ Bhamrah, H. S.; Juneja, Kavita (2003). An Introduction to Porifera. Anmol Publications. p. 58. ISBN 978-81-261-0675-2. ^ Feuda, Roberto; Dohrmann, Martin; Pett, Walker; Philippe, Hervé; Rota-Stabelli, Omar; Lartillot, Nicolas; Wörheide, Gert; Pisani, Davide (2017). “Improved Modeling of Compositional Heterogeneity Supports Sponges as Sister to All Other Animals”. Current Biology 27 (24): 3864. doi:10.1016/j.cub.2017.11.008. PMID 29199080. http://linkinghub.elsevier.com/retrieve/pii/S0960982217314537. ^ Pisani, Davide; Pett, Walker; Dohrmann, Martin; Feuda, Roberto; Rota-Stabelli, Omar; Philippe, Hervé; Lartillot, Nicolas; Wörheide, Gert (15 December 2015). “Genomic data do not support comb jellies as the sister group to all other animals”. Proceedings of the National Academy of Sciences 112 (50): 15402–15407. Bibcode: 2015PNAS..11215402P. doi:10.1073/pnas.1518127112. PMC: 4687580. PMID 26621703. http://www.pnas.org/content/112/50/15402. ^ Simion, Paul; Philippe, Hervé; Baurain, Denis; Jager, Muriel; Richter, Daniel J.; Franco, Arnaud Di; Roure, Béatrice; Satoh, Nori et al. (3 April 2017). “A Large and Consistent Phylogenomic Dataset Supports Sponges as the Sister Group to All Other Animals”. Current Biology 27 (7): 958–967. doi:10.1016/j.cub.2017.02.031. PMID 28318975. https://doi.org/10.1016/j.cub.2017.02.031. ^ Giribet, Gonzalo (1 October 2016). “Genomics and the animal tree of life: conflicts and future prospects”. Zoologica Scripta 45: 14–21. doi:10.1111/zsc.12215. http://onlinelibrary.wiley.com/doi/10.1111/zsc.12215/abstract. ^ Laumer, Christopher E.; Gruber-Vodicka, Harald; Hadfield, Michael G.; Pearse, Vicki B.; Riesgo, Ana; Marioni, John C.; Giribet, Gonzalo (2017). “Placozoans are eumetazoans related to Cnidaria”. BioRxiv: 200972. doi:10.1101/200972. https://www.biorxiv.org/content/early/2017/10/11/200972. ^ Eitel, Michael; Francis, Warren; Osigus, Hans-Jürgen; Krebs, Stefan; Vargas, Sergio; Blum, Helmut; Williams, Gray Argust; Schierwater, Bernd et al. (2017-10-13). 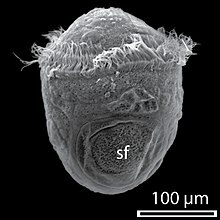 “A taxogenomics approach uncovers a new genus in the phylum Placozoa”. BioRxiv: 202119. doi:10.1101/202119. https://www.biorxiv.org/content/early/2017/10/13/202119. ^ Dunn, Casey W.; Hejnol, Andreas; Matus, David Q.; Pang, Kevin; Browne, William E.; Smith, Stephen A.; Seaver, Elaine; Rouse, Greg W. et al. (2008). “Broad phylogenomic sampling improves resolution of the animal tree of life”. Nature 452 (7188): 745–749. Bibcode: 2008Natur.452..745D. doi:10.1038/nature06614. PMID 18322464. http://www.nature.com/doifinder/10.1038/nature06614. ^ Whelan, Nathan V.; Kocot, Kevin M.; Moroz, Tatiana P.; Mukherjee, Krishanu; Williams, Peter; Paulay, Gustav; Moroz, Leonid L.; Halanych, Kenneth M. (2017). “Ctenophore relationships and their placement as the sister group to all other animals”. Nature Ecology & Evolution 1 (11): 1737. doi:10.1038/s41559-017-0331-3. http://www.nature.com/articles/s41559-017-0331-3. ^ Shen, Xing-Xing; Hittinger, Chris Todd; Rokas, Antonis (2017-04-10). “Contentious relationships in phylogenomic studies can be driven by a handful of genes”. Nature Ecology & Evolution 1 (5): 0126. doi:10.1038/s41559-017-0126. http://www.nature.com/articles/s41559-017-0126. ^ Ryan, Joseph F.; Pang, Kevin; Schnitzler, Christine E.; Nguyen, Anh-Dao; Moreland, R. Travis; Simmons, David K.; Koch, Bernard J.; Francis, Warren R. et al. (13 December 2013). “The Genome of the Ctenophore Mnemiopsis leidyi and Its Implications for Cell Type Evolution”. Science 342 (6164): 1242592. doi:10.1126/science.1242592. PMC: 3920664. PMID 24337300. http://science.sciencemag.org/content/342/6164/1242592. ^ a b c d e f 藤田(2010), pp.117-120. ^ a b c 藤田(2010), pp.120-121. ^ Philippe, H.; Brinkmann, H.; Copley, R. R.; Moroz, L. L.; Nakano, H.; Poustka, A. J.; Wallberg, A.; Peterson, K. J. et al. (2011). “Acoelomorph flatworms are deuterostomes related to Xenoturbella”. Nature 470 (7333): 255–258. Bibcode: 2011Natur.470..255P. doi:10.1038/nature09676. PMC: 4025995. PMID 21307940. https://www.ncbi.nlm.nih.gov/pmc/articles/PMC4025995/. ^ Perseke, M.; Hankeln, T.; Weich, B.; Fritzsch, G.; Stadler, P.F. ; Israelsson, O.; Bernhard, D.; Schlegel, M. (August 2007). “The mitochondrial DNA of Xenoturbella bocki: genomic architecture and phylogenetic analysis”. Theory Biosci 126 (1): 35–42. doi:10.1007/s12064-007-0007-7. PMID 18087755. http://www.bioinf.uni-leipzig.de/Publications/PREPRINTS/07-009.pdf. ^ Cannon, Johanna T.; Vellutini, Bruno C.; Smith III, Julian. ; Ronquist, Frederik; Jondelius, Ulf; Hejnol, Andreas (3 February 2016). “Xenacoelomorpha is the sister group to Nephrozoa”. Nature 530 (7588): 89–93. Bibcode: 2016Natur.530...89C. doi:10.1038/nature16520. PMID 26842059. http://www.nature.com/nature/journal/v530/n7588/full/nature16520.html 2016年2月3日閲覧。. ^ a b Minelli, Alessandro (2009). Perspectives in Animal Phylogeny and Evolution. Oxford University Press. p. 53. ISBN 978-0-19-856620-5. https://books.google.com/books?id=jIASDAAAQBAJ&pg=PA53. ^ a b c Brusca, Richard C. (2016). Introduction to the Bilateria and the Phylum Xenacoelomorpha | Triploblasty and Bilateral Symmetry Provide New Avenues for Animal Radiation. Sinauer Associates. pp. 345–372. ISBN 978-1605353753. http://www.sinauer.com/media/wysiwyg/samples/Brusca3e_Chapter_9.pdf. ^ Quillin, K. J. (May 1998). “Ontogenetic scaling of hydrostatic skeletons: geometric, static stress and dynamic stress scaling of the earthworm lumbricus terrestris”. The Journal of Experimental Biology 201 (12): 1871–83. PMID 9600869. http://jeb.biologists.org/cgi/pmidlookup?view=long&pmid=9600869. ^ Shankland, M.; Seaver, E. C. (2000). “Evolution of the bilaterian body plan: What have we learned from annelids?”. Proceedings of the National Academy of Sciences 97 (9): 4434–7. Bibcode: 2000PNAS...97.4434S. doi:10.1073/pnas.97.9.4434. JSTOR 122407. PMC: 34316. PMID 10781038. https://www.ncbi.nlm.nih.gov/pmc/articles/PMC34316/. ^ a b c d e f g h i j k l m n o p q r s t u v w x y z aa ab ac ad 藤田(2010), pp.136-137. ^ Miller, Stephen A.; Harley, John P. (2006). Zoology. McGraw-Hill Higher Education. p. 173. https://books.google.com/books?id=BWZFAQAAIAAJ. ^ a b 藤田(2010), p.157. ^ a b Siveter, Derek J.; Briggs, Derek E. G.; Siveter, David J.; Sutton, Mark D.; Legg, David (2018-08-01). “A three-dimensionally preserved lobopodian from the Herefordshire (Silurian) Lagerstätte, UK” (英語). Open Science 5 (8): 172101. doi:10.1098/rsos.172101. ISSN 2054-5703. http://rsos.royalsocietypublishing.org/content/5/8/172101. ^ Ramsköld, L.; Xianguang, Hou (1991-05). “New early Cambrian animal and onychophoran affinities of enigmatic metazoans” (英語). Nature 351 (6323): 225–228. doi:10.1038/351225a0. ISSN 0028-0836. https://www.nature.com/articles/351225a0. ^ Dzik, Jerzy (2011). "The xenusian-to-anomalocaridid transition within the lobopodians". Bollettino della Società Paleontologica Italiana, 50(1): 65-74. ^ Budd, Graham E. (2001-01). “Tardigrades as ‘Stem-Group Arthropods’: The Evidence from the Cambrian Fauna”. Zoologischer Anzeiger - A Journal of Comparative Zoology 240 (3-4): 265–279. doi:10.1078/0044-5231-00034. ISSN 0044-5231. https://doi.org/10.1078/0044-5231-00034. ^ Edgecombe, Gregory D.; Giribet, Gonzalo; Dunn, Casey W.; Hejnol, Andreas; Kristensen, Reinhardt M.; Neves, Ricardo C.; Rouse, Greg W.; Worsaae, Katrine et al. (June 2011). “Higher-level metazoan relationships: recent progress and remaining questions”. Organisms, Diversity & Evolution 11 (2): 151–172. doi:10.1007/s13127-011-0044-4. ^ Fröbius, Andreas C.; Funch, Peter (2017-04-04). “Rotiferan Hox genes give new insights into the evolution of metazoan bodyplans”. Nature Communications 8 (1). Bibcode: 2017NatCo...8....9F. doi:10.1038/s41467-017-00020-w. http://www.nature.com/articles/s41467-017-00020-w.
^ Smith, Martin R.; Ortega-Hernández, Javier (2014). “Hallucigenia’s onychophoran-like claws and the case for Tactopoda”. Nature 514 (7522): 363–366. Bibcode: 2014Natur.514..363S. doi:10.1038/nature13576. https://doi.org/10.1038/nature13576. ^ Yamasaki, Hiroshi; Fujimoto, Shinta; Miyazaki, Katsumi (June 2015). “Phylogenetic position of Loricifera inferred from nearly complete 18S and 28S rRNA gene sequences”. Zoological Letters 1: 18. doi:10.1186/s40851-015-0017-0. https://doi.org/10.1186/s40851-015-0017-0. ^ Nielsen, C. (2002). Animal Evolution: Interrelationships of the Living Phyla (2nd ed.). Oxford University Press. ISBN 0-19-850682-1. ^ a b 藤田(2010), pp.174-175. ^ a b 藤田(2010), p.169. ^ a b c d e f g h 藤田(2010), pp.169-172. ^ a b c 藤田(2010), p.173.